Beggars All: Reformation And Apologetics: Does Ephesians 4 Refute Sola Scriptura? Does Ephesians 4 Refute Sola Scriptura? Here's how the argument goes. Protestants say 2 Timothy 3:16-17 teaches that the Scriptures are God breathed and able to "fully equip a man for every good work." The Scriptures do not say an infallible oral Tradition of extra-Biblical information passed down along side of the Scriptures likewise does the same. Nor do the scriptures teach God created an infallible church that is God-breathed that will fully equip a man for every good work... or does it? Consider Ephesians 4:11-16. 11 And He gave some as apostles, and some as prophets, and some as evangelists, and some as pastors and teachers, 12 for the equipping of the saints for the work of service, to the building up of the body of Christ; 13 until we all attain to the unity of the faith, and of the knowledge of the Son of God, to a mature man, to the measure of the stature which belongs to the fullness of Christ. 14 As a result, we are no longer to be children, tossed here and there by waves and carried about by every wind of doctrine, by the trickery of men, by craftiness in deceitful scheming; 15 but speaking the truth in love, we are to grow up in all aspects into Him who is the head, even Christ, 16 from whom the whole body, being fitted and held together by what every joint supplies, according to the proper working of each individual part, causes the growth of the body for the building up of itself in love. Notice that Paul says that leaders of the church play the role of "equipping of the saints" to eventual maturity. So... the Protestant interpretation of 2 Tim. 3:16-17 is at odds with Eph. 4, because here we see that the church also plays a role in bringing the church and the individual Christian to spiritual maturity. Is this a Refutation of sola scriptura? No, hardly. Notice the leaders who are in charge of equipping the saints: apostles, prophets, evangelists, pastors and teachers. What is the primary tool used by these offices in their respective ministries? That's right, you guessed it, the Word of God. Notice that in Acts 2:42 the believers devoted themselves to the apostles' teaching. What were they teaching? The Word of God. During the writing of the New Testament, this Word of God certainly existed in both oral and written form, but it was still... the Word of God. Every Sunday I sit in church and hear my Pastor preach the Word of God. It exhorts and prepares me for works of service, and it also unifies me with the rest of the church as we work together towards Christian maturity. We learn about the Son of God, as revealed in the scriptures, and we're instructed in the Word of God so as to not be carried about by every wind of doctrine, by the trickery of men, by craftiness in deceitful scheming. 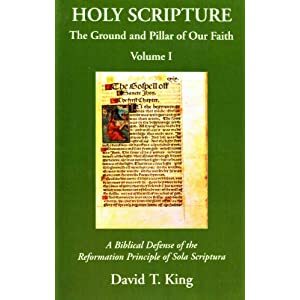 Sola Scriptura functions as the authoritative norm for the people of God, and therefore stands as the only existing source of the deposit of faith that special revelation has disclosed. This is one reason why Paul wrote as he did in his closing remarks in Romans. He spoke of 'the revelation of the mystery kept secret since the world began but now has been made manifest, and by the prophetic Scriptures has been made known to all nations, according to the commandment of the everlasting God, for obedience to the faith' (Rom 16:25-26). According to the testimony of the Apostle Paul, Scripture has manifested this mystery, and this mystery is authoritatively interpreted by the epistles of the New Testament. God hath gathered up into the Scripture all divine revelations given out by himself from the beginning of the world, and all that ever shall be to the end thereof, which are of general use unto the church, that it may be thoroughly instructed in the whole mind and will of God, and directed in all that worship of him and obedience unto him which is necessary [italics added] to give us acceptance with him here, and to bring us unto the eternal enjoyment of him hereafter...When God first committed the law to writing, with all those things which accompanied it, he obliged the church unto the use of it alone, without additions of any kind. Now, this he would not have done had he not expressed therein, - that is, in the books of Moses, - all that was any way needful unto the faith and obedience of the church: for he did not only command them to attend with all diligence unto his word as it was then written, for their instruction and direction in faith and obedience, annexing all sorts of promises unto their so doing, Deut. vi. 6, 7, but also expressly forbids them, as was said, to add any thing thereunto or to conjoin any thing therewith, Deut. iv. 2, xii. 32; which he would not have done had he omitted other divine revelations before given that were any way necessary unto the use of the church. [Notice now carefully what Owen proceeds to say] As he added many new ones, so he gathered in all the old from the unfaithful repository of tradition [italics here added], and fixed them in a writing given by divine inspiration. In the end, the matter of authoritative revelation boils down to a question of preservation. Regardless of the assertions of Roman apologists, when the dust settles, there is one question they cannot answer. Can you name one oral, extrabiblical tradition, demonstratively traceable to the apostolic age, which is necessary for the faith and practice of the Church of Jesus Christ? No verifiable example has been or can be offered. We affirm with the Apostle Paul, 'that according to the Way which they call a sect (or heresy), so I worship the God of my fathers, believing all things which are written in the Law and in the Prophets' (Acts 24:14). You self-refuted your thesis with this comment: "Notice that in Acts 2:42 the believers devoted themselves to the apostles' teaching. What were they teaching? The Word of God. During the writing of the New Testament, this Word of God certainly existed in both oral and written form, but it was still...the Word of God." As you admit, the "Word of God" is not a synonym for "Scripture" and thus the Apostolic Christians were not living according to a Sola-Scriptura paradigm but a "Word of God" paradigm. This came from authoritative and infallible Apostles heading the Church. "If unwritten tradition was to be regarded as a reliable means and/or source for the preservation of binding revelation beyond the time of the apostles, and intended to function perpetually as an authoritative norm alongside Scripture, why did Paul fail to mention such a concept"
He admits unwritten tradition was a reliable means and source of revelation. He then has to explain it away, as if divine revelation just vanished or else 'must have' become inscripturated. Also, you said: "Notice who gets equipped: apostles, prophets, evangelists, pastors and teachers." That's not what the passage is saying; the passage is saying these men in their various capacities fully equip Christians. Thanks for your private interpretation. James, why not actually reply to the ACTUAL points Nick made instead of using a caricature of the catholic position? This came from authoritative and infallible Apostles heading the Church. Of course. But there aren't any more of those. They've been dead a while. Who, King? Where did he do so? as if divine revelation just vanished or else 'must have' become inscripturated. Some of it vanished, some became inscripturated. You claim there's more in some amorphous mass of Sacred Tradition, whose bounds you can't define and whose location you can't identify. But I invite you to try...again. Where is this unwritten divine revelation? the passage is saying these men in their various capacities fully equip Christians. Even if that were true (arguendo), it does nothing to push against Sola Scriptura. 1) it IS indeed Nick's private interp? 2) 'twas not we who introduced the "that's just your private interp!" argument, but rather Roman Catholics? Why should anyone think that you know the RC position better than the dozens who have (unwisely) used that (stupid) argument against us? Interpretation of what? The words of James and David? 'twas not we who introduced the "that's just your private interp!" argument, but rather Roman Catholics? ahhh nobody is arguing here about who knows the RC position better. I don't even see the relevancy of your point. Yes, of James, David, the Bible. You said it was a caricature. It isn't. nobody is arguing here about who knows the RC position better. You said it's a caricature. The dozens of online RCs who have used that very argument say otherwise. Where did he offer an interpretation of James or David? He simply pointed out that they refuted themselves. The catholic church's teaching of private interpretation does not say that one is incapable of properly interpreting. Your understanding says that the catholic church is saying precisely that. So yes it is a caricature. You will need to give me something more than that. I can't deny or affirm what you are saying as it stands. I forgot to address this point: the Bible. Again he didn't offer an interpretation of the bible. He did however say "That's not what the passage is saying; the passage is saying these men in their various capacities fully equip Christians." The scriptures do say it is these men who are equipping contra what James said. That is hardly an interpretation, just a restatement of what is said. Pointing out self-refutation requires interpretation. Not that I think he succeeded in his attempt. James didn't claim that RCC says one is incapable of private interp. What does "incapable of private interpretation" even mean? I have no desire to give you more than that - if you care, you can search the archives of this blog. You're just going to have to trust me, since I've dealt with a lot more RCC epologists on this topic than you. That isn't even a quote of my words. That's right, I typed the entry out quickly yesterday. I will change the sentence to read differently. That's not what I meant to state. The sentence is now changed to reflect what I meant to say. As to my earlier comment on Nick's private interpretation.... that's indeed what it is, so on a fundamental level, there's really no reason to respond to any of Nick's Biblical comments. He isn't the magisterium, he's Nick. Because Nick's comments assume there is some other body of infallible God-Breathed special revelation out there somewhere when he states,He admits unwritten tradition was a reliable means and source of revelation. He then has to explain it away, as if divine revelation just vanished or else 'must have' become inscripturated. "Can you name one oral, extrabiblical tradition, demonstratively traceable to the apostolic age, which is necessary for the faith and practice of the Church of Jesus Christ?" I would go a step further, and ask for any examples to be proven to be of apostolic pedigree. Where in the text of Eph. 4 is an infallible magisterium mentioned, or infallible Tradition? If either of these infallible sources can be shown to be in Eph. 4, then sola scriptura isn't sola, it would then be infallible scriptura plus whichever one of those two choices can be proven. The burden is on the Roman apologist to produce the other divine infallible authority. This entry has one fundamental purpose- to demonstrate that there's a consistent way to understand 2 Tim 3 and Eph. 4 that does not create any tension for the doctrine of sola scriptura. “Do not judge, or you too will be judged. 2 For in the same way you judge others, you will be judged, and with the measure you use, it will be measured to you." So, for years pop-Roman apologists have been accusing Protestants of privately interpreting the Bible, and pointing out how awful this is. There's simply no denying that. Then, when an anonymous Roman Catholic blogger gives his own private interpretation of Scripture, that's OK because "The catholic church's teaching of private interpretation does not say that one is incapable of properly interpreting." Exactly how do I know Nick is correctly representing his magisterium by his biblical interpretations? In other words, Roman Catholic individual interpretations of...anything... have an aspect of futility inherent in them. I am at a disadvantage in regards to what "pop-Roman apologists" have said to protestants regarding "privately interpreting the Bible" since I haven't seen those interactions. Therefore I can't offer much on this. Based on how I see protestants giving their caricature of the catholic position, I can't give the above argument much weight. Isn't it more likely that catholics understand what the church means by "private interpretation" and are using the word in the sense that the church means, but you and other protestants are the ones who are failing to understand what is meant and thus are simply attacking a straw man? Since you don't know what the other pop apologists have said, how could you know whether we're offering a caricature? Are you reading your own comments? Apparently my last reply was deleted, i.e., the one you are replying to. "I am at a disadvantage in regards to what "pop-Roman apologists" have said to protestants regarding "privately interpreting the Bible" since I haven't seen those interactions. Therefore I can't offer much on this." I doubt it was deleted; most probably it was caught in Blogger's lousy spam filter. well if James confirms that he didn't delete it then I will repost it here. Otherwise I don't want to waste time by posting something that James will delete. Please note this is not a second guessing of James intentions by any means. Yes, that's what happened. The spam filter rarely does this anymore. Instead, when quoting someone, it's best to format the citation either in bold, or in italics. No, because we (or at least, I) am speaking in terms of epistemology. I am applying back the same standard by which most pop-Roman apologists use when commenting on Protestantism. Sure, of course Rome may allow you to practice some form of private interpretation. You need to go a level deeper than the surface of your own belief system. How do you know you're interpreting the Bible or Rome correctly? It's the same sort of questions that Romanists ask Protestants: "How do you know you're interpreting the Bible correctly?" Lest a big point is missed (and to bring this back around to the content of this post), Roman Catholics do not believe the Scriptures are the sole infallible rule of faith. They believe there are other infallible rules of faith along with Scripture. Roman Catholics often posit that without these other infallible rules of faith, the Scriptures cannot be understood correctly or with certainty. Such assumes though the other infallible rules of faith can be understood correctly or with certainty. It is my contention that each infallible rule needs to be interpreted by each person that submits to that infallible rule or authority. So, when Nick drops by and leaves his private interpretation of a Biblical passage, he's also in essence leaving me his private interpretation of his other rules of faith as well. So, as I stated above, "Exactly how do I know Nick is correctly representing his magisterium by his biblical interpretations? In other words, Roman Catholic individual interpretations of...anything... have an aspect of futility inherent in them." What about what I said was "private interpretation"? Surely not the quotes of you and Mr King. All I did was quote your own words and showed an equivocation going on. You began by defining "Word of God" as both the written and unwritten Apostolic teaching and ended by saying "Word of God" was Scripture alone. And since this came from the mouths of authoritative Apostles, then we see clearly in the Apostolic Church (1) Magisterium, (2) inspired unwritten teaching, (3) inspired written teaching. That's 100% Catholic. There is no "private interpretation" here, as Hapax has pointed out - I'm more or less restating what you asserted. Dude, showing the equivocation requires interpretation. It's like RC epologists are en masse completely ignorant of basic principles of philosophy of language. Prove it was never written down. Then, if you haven't interpreted anything, and simply restated what I said, then we really don't have anything to talk about. I agree that interpretation is always part of understanding anything pretty much. But establishing that is simply moot. I don't believe Nick was offering an explanation beyond what is obvious to anyone who can read english. Does Nick or the Catholic church subscribe to the view of private interpretation that you are attempting to put on him? If not then this is completely a non-issue. As Nick pointed out James established in his article that the word of God is able to fully equip even if it is not enscripurated. He didn't use those exact words, but is he willing to deny that conclusion? David King established that tradition was " reliable means and/or source for the preservation of binding revelation "
So that is simply confirmation coming from them that these ideas are scriptural. Since they are scriptural, the burden of proof would be on you to demonstrate that these are no longer valid. It would seem to me that your own principle would require you to prove these points from scripture alone. That doesn't matter. "That's just your interpretation!" is a one-size-fits-all stupid objection. Does Nick or the Catholic church subscribe to the view of private interpretation that you are attempting to put on him? Whether RCC does, we can't know. The Magisterium doesn't stoop to letting the unwashed masses know the truth about serious issues like that. Far better to sit back, do mostly nothing, and move pædophiles around. He didn't use those exact words, but is he willing to deny that conclusion? Mmmm, speaking for myself, that sounds reasonable **IF** one has all the Word of God that God intended to give. In the Scripture, we can be sure we have that. But that's one of the main points at hand, and we've both asked for it several times - where is this extra revelation? Where may we examine it? Since they are scriptural, the burden of proof would be on you to demonstrate that these are no longer valid. I don't think we care to say they're no longer valid. We're asking you to show us it actually exists. And let's cut to the chase - we know you can't produce it. We've asked literally hundreds of educated RCs just like you where to find it. I asked Mitch Pacwa, twice, face to face, for crying out loud. We ask you the question we know you can't answer b/c it destroys your allegations that more is needed than "just" the Scripture. You said: "Dude, showing the equivocation requires interpretation." So now the words of any layman require "private interpretation"? Are you "privately interpreting" this very post? Of course I am privately interpreting this post and all the text here. That's precisely my point every time someone - RC, EOdox, Emergent, postmodern relativist, whatever - raises this ludicrous objection. Rhology : That doesn't matter. "That's just your interpretation!" is a one-size-fits-all stupid objection. There are a couple of things I hope to reply to later on. But for now I would like to spend a little more time on the topic of private interpretation. In terms of Peter's (1 peter 1:20-21) use of the idea, how do you understand him? How is his use different than yours? Do you mean 2 Peter 1? Interpretation of a prophecy received by an individual church member, is not in view here; rather the emphasis is on the means of God's inspiring the text. Peter says that the prophetic word is yet more certain than his own eyewitness experiences, and goes on to tell us that "no prophecy was ever made by an act of human will, but men moved by the Holy Spirit spoke from God". But for now I would like to spend a little more time on the topic of private interpretation. Do you really think the opinions of either you or Nick are actually more meaningful than a Mormon's because your church allows you some degree of private interpretation? I'm going to continue to nail away at the fact the Rome herself, in whatever she infallibly reveals to you has to be interpreted by you. This is why individual Roman Catholics have different opinions about... Roman Catholicism. So, when Nick drops by to leave his opinion on something, there isn't really any logical reason why I should consider his interpretation or arguments any more compelling than any other anonymous Internet person, protestant or Roman Catholic. That is, a blatant dismissal of Nick, perhaps not the most polite etiquette, is certainly a logical conclusion to someone on their way out the door to work at 7:16 AM who reads in the existence of an infallible tradition into Eph. 4 that he cannot, with any meaning or substance, actually demonstrate exists. Why do we have to wrangle with the likes of you? In other words, why hasn't the Magisterium infallibly settled all this, definitively? The irony here is that there is a breakdown in communication as to what "private interpretation" even means. Private Interpretation does not mean you cannot use the faculty of reason. It does not mean you cannot read or write. It does not mean you cannot form arguments or respond to questions. It does not mean you should not follow your conscience. And most importantly, it does not mean Catholics are incapable or not allowed to exegete the Scriptures or other Church documents. Private Interpretation applies strictly to an official ecclesiastic teaching capacity. It means one cannot teach officially unless they possess the authority to do so. In short, it rejects the idea everyone can go around acting as their own pope. Anyway, I see this as one big tangent from the original objection, which is that "Word of God" is not a (strict) synonym for "Scripture". Good point. I took care of that here. Objection? I thought you said earlier that you were "more or less restating" what I asserted and not privately interpreting anything. If you have an objection, obviously you have another interpretation.